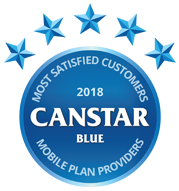 Canstar Blue reviews & compares phone plan providers 2Degrees, Spark and Vodafone based on factors including value for money, their customer service, accessibility, billing, network coverage, assistance managing data and overall customer satisfaction. * Overall satisfaction is an individual rating and not a combined total of all ratings. Brands with equal overall satisfaction ratings are listed in alphabetical order. Canstar Blue research finalised in March 2018, published in March 2018. For the fourth year in a row, 2degrees has taken out top spot for customer satisfaction for phone plans, while Spark and Vodafone achieved four and three stars respectively. Mobile phone plans these days are more than just calls and texts – data is often the key battleground among telcos. With data, you can stream Netflix and the All Blacks, watch cat videos, catch up on social media and read the news. When you’re out and about, a decent phone plan can be incredibly handy, and Kiwis are increasingly getting good value and more data out of their plans. One way Kiwis stay on top of the latest and greatest is to bundle their phone plan with a new phone, which the three biggest providers – 2Degrees, Spark, and Vodafone – offer. With many smartphones retailing for over $1,000, it’s little wonder many of us are bundling a phone with a plan, to stem that hefty upfront cost. 2degrees generally smashed the competition with five stars in every category except for network coverage. Spark was the only other telco to get top marks in any category, where it achieved five stars for network coverage. It’s the fourth year in a row that 2degrees has topped these ratings – a remarkable achievement in the face of tough competition. The market can move very quickly, especially when new handsets come out, so it pays to shop around and regularly compare offers from different providers. But in recent years, the Kiwis who have taken part in our research are reporting that 2degrees is ahead of the game. To help you decide which provider and plan is the best fit for you, here is an overview of what 2degrees, Spark, and Vodafone currently have to offer. 30% of Kiwis report keeping track of their phone usage to get the best value for money. So, what are the providers offering and where can you find a great deal? To bundle a phone on a plan you generally need to stick with the three biggest providers – 2degrees, Spark, and Vodafone – especially if you want the latest phones. Review some of the options below. 2degrees offers a staggering range of plan and phone options. It has access to the latest and greatest iPhones and Samsung Galaxy models, with an even wider variety of plans you can bundle your phone with. The latest iPhone 8, for example, can be bundled from about $74 per month over 36 months, which includes a $40 plan that comes with 3GB data. 2degrees ticked most boxes in this year’s user ratings, including key areas such as value for money and customer service. There’s a good chance you’ll find the right plan for your needs with one of NZ’s largest phone providers. Spark was another competitive brand, achieving four stars for overall satisfaction and indeed in many other categories. It also stood out with five stars for network coverage – the only network to do so. Spark also provides the latest and greatest phones, with iPhones and Galaxy S9s available from around $90 a month. You can then bundle these phones with a choice of ‘terms’. Open term plans run month-by-month, but you will get many more perks and features if you commit to 24 months. You’ll also get access to more than 1000 Wi-Fi zones with Spark, and you are afforded unlimited data on these hotspots so you don’t have to worry about using your data all the time. Spark also includes many other perks such as included Netflix, Lightbox and more on some plans. Vodafone was rated three stars overall by New Zealand customers, but the global telco still has plenty to offer. For example, Vodafone is the only phone provider of the three in our ratings to offer an explicit ‘plan builder’ on its website, where you first choose your plan, then choose your phone, then pay – and voila! iPhone 8 plans tend to cost around $100 a month, but you’ll get a stack of data inclusions for your troubles, plus unlimited talk and text, as well as calls to Australia. A number of handsets are available for $0 upfront, but for the latest and greatest you should expect to pay a nominal amount to kick things off. Vodafone also has stuff such as included streaming from time to time, so it pays to check back in regularly to see what you can get. Vodafone NZ was rated three stars overall. How are Kiwis using mobile phones? More than a third of households have ditched their landline to solely use their mobile phone. Communication is also changing, with over half of survey respondents reporting they use their phone for Facebook Messenger, Snapchat or Whatsapp as their chat functions. Nearly a quarter also admitted to using their phone while driving and not using handsfree capability. With the way car technology is going, we hope this figure goes down over time! Should I buy a phone on a plan? Choosing a phone on a plan is a great way to get your hands on the latest smartphones, without having to stump up the full price outright. However, it’s important to check out the full terms and conditions of your plan before diving into a lengthy contract. Plans with the latest phones bundled in can easily exceed $100 per month – so you’ll have to consider if you can afford that. If you can, you do stand to receive tasty benefits such as included streaming, Wi-Fi hotspots and more, and you usually can’t get these perks on other types of plans. Also make sure that you understand what you might be charged for exceeding your plan’s limitations, and how much it will cost you to break the contract early. Even if you’re reasonably satisfied with your existing provider, it’s worth comparing offers from all of those mentioned in this report, to make sure you’re getting the right deal for your specific needs. Canstar Blue commissioned I-view to survey 5,000 New Zealand adults across a range of categories to measure and track customer satisfaction. The outcomes reported are the results from customers within the survey group who have an active mobile phone plan and pay the bills – in this case, 1,277 people. The 5G Mobile Future: What can we expect?